My daughter is convinced that she is the Only One in her first-grade class that celebrates Chanukah. She probably is. Last year, during her kindergarten year, she was. And the only other first grader attending her school that I know of to be Jewish is in another classroom. So that means she’s a member of the Only One Club. And lucky for me, she isn’t too sad about it. A few years ago we received a book called “The Only One Club” courtesy of the PJ Library, a wonderful program that distributes free books to Jewish children (if you are Jewish and want to receive the books, here’s the contact). 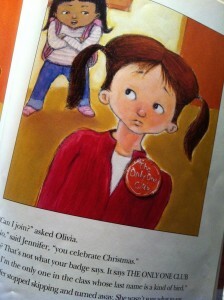 The Only One Club, written by Jane Naliboff, tells the story of a little girl named Jennifer who is the only one in her class who doesn’t celebrate Christmas. When the teacher announces that the class is going to make Christmas decorations, Jennifer raises her hand and tells the teacher that she celebrates Chanukah. The teacher then asks, “Are you the Only One?” And she is. Jennifer goes home and tells her parents the news. After dinner, she heads up to her room, gets out her craft supplies and makes herself a “badge” that reads “The Only One Club”. The next day at school, she wears the badge, and explains it to her friend who spots it that she decided to start the club – and she’s the only one in it. The other kids start noticing it. And they ask her if they can be in the club too. At first, she says they can’t be in the club, because they celebrate Christmas — and ruffles a few feathers. But by the end of the day, Jennifer re-thinks her membership policy. 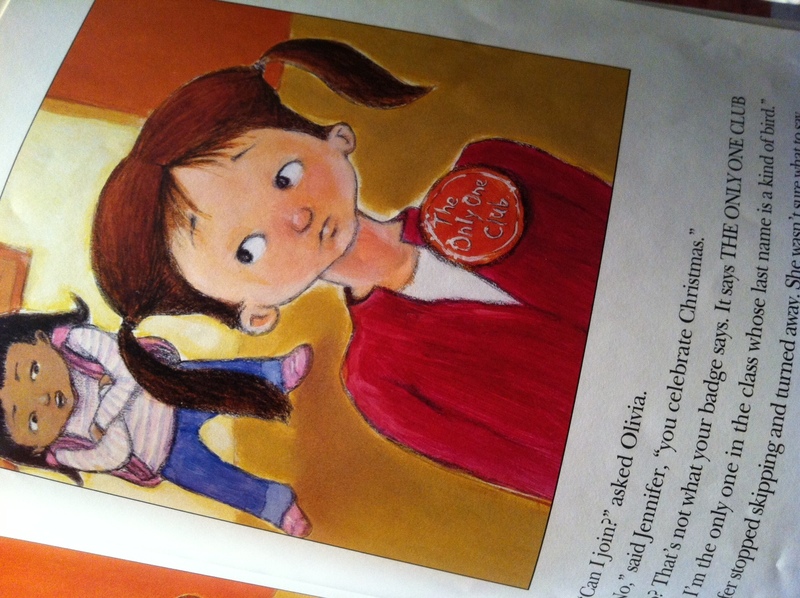 Jennifer goes home that night and makes a lot more badges, and in the morning, she admits her entire class into The Only One Club. The Only One who has red hair. The Only One who has a pet iguana. And my personal favorite – The Only One who was born on a bus. This story could turn out a whole other way. But Naliboff writes it in a way that makes being the Only One special — and then again, not so special at all. The message — that we are all the Only One of something, that we are all special, that we are all individuals, that we all have value — is invaluable. It has given my daughter some tools to deal with the disappointment she feels that she has no Elf in her house, and that we won’t be taking any photos with Santa. She knows that she is special. And not just because she will be eating latkes this holiday season. I’m hoping to read The Only One Club in my daughter’s classroom next week, and bring with us some very special badges for all the other first graders — so they can belong to The Only One Club too. Who knows, maybe we’ll even find out that one of her classmates was born — you guessed it — on a bus. Or maybe, just maybe, they will all see each other for what they are — special — regardless of what holidays they celebrate in December. Laura Weisskopf Bleill is the co-founder and editor of chambanamoms.com. You can reach her at laura@chambanamoms(dot)com.